To be timeless, a work of art must expose some universal human truth: The dangers of pride, the power of faith, the ravages of war, the exquisite agony of love. Kalidasa, arguably the greatest Sanskrit poet in history, created such a work - a lyrical poem that, in over 2,500 years, has lost none of its poignancy, beauty, or relevance. Meghadootam is a love letter from a man to his distant wife. Those are the bones of this great poem, and they are as familiar to us as they were to Kalidasa's audience millennia ago. A Yaksha - a divine attendant - disappoints his master, Kubera, and earns exile to the wilds of central India. He pines for his wife, who remains in Alaka, their home. Lacking smartphone, internet, landline, or even a pony express, the Yaksha turns to a unique courier. He calls upon a cloud to carry his message of love. And, we find, as he recites his missive, that his love is not confined to his wife. He loves the land, as well. He describes with palpable affection the landscape the cloud will traverse in its journey to deliver a husband's love to his wife. CCA is bringing this timeless story to the stage, as an operatic ballet that visualizes the beauty of Kalidasa's poem and celebrates the richness of the Sanskrit language. This is a production built on the foundation of CCA's credo: Modern perspective, ancient tradition, timeless values. Kalidasa and Sanskrit provide the tradition and the values; CCA is lending a contemporary treatment to highlight the modern relevance of this ancient work. 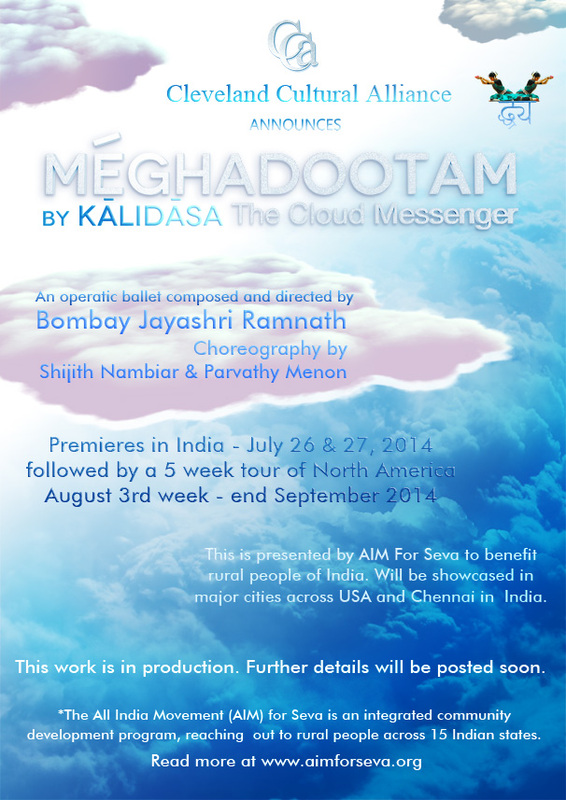 Meghadootam is a culmination of many ambitions. Oscar-nominated artist, Bombay Jayashri Ramnath, brings her unique voice, and rich experience to this production as the production's music composer and Director. And Kalakshetra veterans Shijith Nambiar and Parvathy Menon apply their innovative concepts and traditional foundation as choreographers. CCA is proud to collaborate with these artists to bring Sanskrit, and Kalidasa, to contemporary audiences.